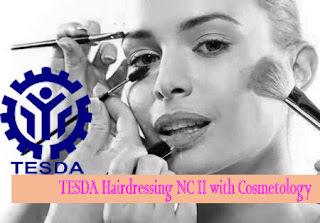 One of the short courses offered by TESDA in the Philippines is the Hairdressing NC 2 with Cosmetology. It only takes a minimum of 656 hours to complete and become a professional make-up artist or haircutter. Meanwhile, all student who enrolled in this course should undergo and pass the Competency Assessment to have a National Certificate (NC II). In this course, you will learn the proper performing of pre- and post- hair care activities, hair and scalp treatment, hair perming, hair coloring, haircutting, hair bleaching, hair straightening and make-up applying. Where to pass those requirements? And how? gudDay!! where should i pass all the requirements? please let us know where the exact places.. thank you and have a good day..
Where can I pass my requirements? Do you have an accredited school here in Bataan? do you have accredited school in Carmona Cavite? may i know kung san ko pedeng ipasa yung requirement? Hi good day..may i ask if a grade 10 student can get a class of cosmetology for weekend or summer?? My babayaran pa po ba sa hairdressing NC ll with cosmetology course ? how to pass the requirements po?im willing to learn for the sake of my kids for extra income for them.thank you so much for this opportunity.god bless po! Tinatanggap po ba ng Texas Board for Cosmetology ang NC 2? hello po.. start today january 20 ang hairdressing..till april..
Hi! I would like to enroll a soon as possible. But if I may ask how much is the tuition fees and how many months it could possibly take? Interested, pero hindi ko po alam paano mag enrol. Patulobg po sa nakaka alam.